Nine years after UNSC 1540 passed, progress remains uneven and incomplete. These are the times that try men's souls — if you work for the U.S. Defense Department, at any rate. This week, to beat the furlough blues, the Naval Diplomat morphs into his alter ego … the Nonproliferation Diplomat! Two or three times per year I co-edit the 1540 Compass, a new-ish journal based at the University of Georgia Center for International Trade and Security, where I spent five happy years before decamping to the Naval War College. It's good to still be a Bulldog. The Compass has a practical bent, along with a seemingly narrow-gauge outlook. It takes its inspiration from UN Security Council Resolution 1540, a measure passed in 2004 that requires UN member states to enact stringent export controls, meaning the laws and regulations governments use to restrict the traffic in the makings of chemical, biological, radiological, and nuclear weapons. Of equal concern are the delivery systems — chiefly ballistic missiles — that hostile governments, terror groups, and other evildoers could employ to strike at cities and other soft targets with unconventional payloads. Far from being a niche publication, then, it turns out that the Compass is part of an enterprise of impressive sweep. Contributors explore what amounts to an effort to construct and maintain a universal multinational coalition to thwart weapons proliferation. This is no easy feat. UNSCR 1540 is an odd beast as UN resolutions go. The United Nations typically acts under Chapter VI of the UN Charter, recommending that governments take this measure or that. Once in a while it acts under Chapter VII, directing some ne'er-do-well like Saddam Hussein or Kim Jong-il to cease and desist from doing something inimical to international peace and security. UNSCR 1540 appeared under Chapter VII as well. But this time, rather than narrowcast its directive, the council made it mandatory for all member governments. 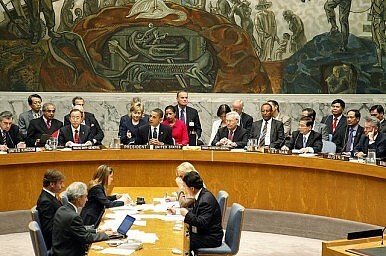 In effect, then, fifteen Security Council members ordered nearly two hundred countries to change their domestic laws. Whoa; that's enough to set a Jeffersonian democrat's nerves a-jangling. Nonetheless, most governments have gamely set about trying to comply with the UN mandate. The process underscores several things about coalition-building and maintenance. For one thing, such arrangements seldom fall into place on command. By my count, nine years have elapsed since 2004, but few UN members have complied fully with the resolution. That's not to fault the laggards, merely to point out that, even for the Security Council, issuing a ukase doesn't automatically make it job one for national governments. Domestic politics commonly intrudes, for example. Political leaders have manifold responsibilities for the health, welfare, and morals of their citizens, and finite resources to execute those responsibilities. And in countries with popular government, voters cast their ballots mostly on such basic matters, not on seemingly remote and abstract menaces such as proliferation. Export controls are one competing requirement among many. UNSCR 1540, arms-control covenants, and other statements of common purpose are important, but not all-important. Moving outward into the international domain, mutual interests, social and cultural affinities, and leading states' capacity to finance an arrangement or strong-arm partners into it represent the glue that binds together multinational enterprises. Everyone agrees that proliferation is a bad thing. Negligence could bring about a doomsday scenario — a nuclear, biological, or chemical 9/11 or Mumbai attack. But such an assault has never yet taken place. That's a good thing, but it does leave the threat in the realm of the hypothetical. It takes artful statecraft to summon forth popular support for open-ended endeavors like combating the spread of mass-destruction weaponry — especially for countries that manufacture no hardware or substances useful for building unconventional arms. It's far from a foregone conclusion that export controls will remain at the forefront of national agendas, despite universal acclaim for the ideal of nonproliferation. As far as sociocultural affinities … fuggedaboutit. A consortium encompassing the United States and the Maldives is about as diverse as it gets. That leaves positive and negative inducements. Sure, the Security Council can coerce under Chapter VII, but as you can imagine, a perennial topic for 1540 Compass contributors is how the international community can pool resources to help everyone meet the standard. Carrots usually yield better results than sticks. This is a question not just of finances but of technical expertise. Individual governments have offered assistance to, say, countries that are exploring nuclear power but haven't yet caught up on the security arrangements necessary to keep lethal materials out of the wrong hands. A standing 1540 Committee helps coordinate efforts to put the resolution into effect. And a veritable alphabet soup of regional and global organizations that go by such acronyms as IAEA, NSG, G-8, and EU has gotten into the export-control act in various ways. Whither UNSCR 1540? My guess is that coalition-builders will find it easier rallying a standing, globe-spanning consortium to fight proliferation than they will uniting a coalition to safeguard freedom of the seas. The repercussions of failure could be cataclysmic if 1540 falls short, whereas Captain Jack Sparrow poses more of a nuisance to shipping than a mortal danger. The former concentrates minds, the latter less so. Nevertheless, it's a safe guess that the 1540 regime will exhibit the same uneven, patchwork character found in maritime coalitions. Nonproliferation officials and advocates have plenty of work to occupy them. The Nuclear Test Ban: Time to Finish What We StartedPast as Prologue? What North Korea Teaches Us About Iran’s Nuclear ProgramAssessing UNSCR 1540: Ten Years OnThe Second Nuclear Age Can China be a World Leader?